J. Am. Chem. Soc. 2008, 130, 16858-16860. We have established, for the first time, a practical synthesis of chiral 1,1'-binaphthyl-2,2'-disulfonic acid (BINSA, 1) from inexpensive BINOL. An efficient enantioselective catalysis in the Mannich-type reactions of diketones and ketoester equivalents with aldimines was developed using chiral 1-achiral 2,6-diarylpyridine (2) combined salts, which acted as convenient chiral tailor-made Bronsted acid-base organocatalysts in situ. Adv. Synth. Catal. 2008, 350, 1776-1780. The catalytic enantioselective cyanosilylation of aromatic ketones was developed by using chiral lithium salts of (R)-BINOL- or (S)-BINAM-derived phosphoric acid compounds. In the presence of 10 mol% of chiral conjugate lithium salts, the corresponding tertiary cyanohydrins were obtained in high yields with moderate to high enantioselectivities. This is the first efficient example of asymmetric catalysis using lithium salts of synthetically useful chiral phosphoric acid compounds. A possible catalytic mechanism and transition states are also discussed as a preliminary working hypothesis. Tetrahedron Lett. 2008, 49, 5017-5020. Under open-air and solvent-free conditions, catalytic amounts of sulfonic acids efficiently promote ester condensation between an equimolar mixture of carboxylic acids and alcohols. Since the present protocol does not require solvents under open-air conditions, a large amount of esters can be synthesized in a rather small apparatus. Org. Lett. 2008, 10, 3191-3194. The direct and catalytic kinetic resolution of racemic carboxylic acids bearing a Bronsted base such as O-protected α-hydroxy carboxylic acids and N-protected α-amino acids has been accomplished through an L-histidine-derived sulfonamide-induced enantioselective esterification reaction with tert-butyl alcohol for the first time. Highly asymmetric induction [S(kfast/kslow) = up to 56] has been achieved under the equilibrium between a chiral catalyst and two diastereomeric acylammonium salts through an intramolecular hydrogen-bonding interaction. Chem. Record 2008, 8, 143-155. 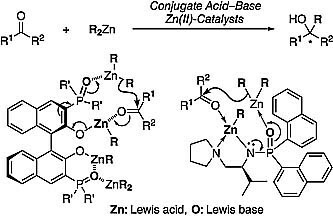 A highly enantioselective organozinc (R2Zn) addition to a series of aldehydes and ketones was developed based on conjugate Lewis acid-Lewis base catalysis. Optically active secondary and tertiary alcohols were obtained in high yields with high enantioselectivities without Ti(IV) compounds. Bifunctional chiral 3,3-diphosphoryl-BINOL ligands were designed and prepared through a phospho-Fries rearrangement as a key step. On the other hand, bifunctional chiral phosphoramide ligands were designed and prepared from L-valine. Mechanistic studies were performed by X-ray analyses of Zn(II) cluster and chiral ligands, a 31P NMR experiment on Zn(II) complexes, and stoichiometric reactions with some chiral or achiral Zn(II) complexes to propose a transition state assembly that includes monomeric active intermediates. 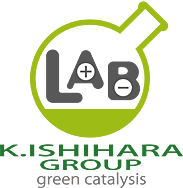 For synthesis of secondary and tertiary alcohols, practical carbon-carbon bond forming reactions between organometallic reagents and carbonyl compounds have been developed over a century since the discovery of Grignard reaction in 1900. Traditional organometallic reagents (i.e. Li, Mg, Si, Cu, and Zn reagents) should involve some fundamental functions, such as alkylating reagents, Lewis acids, and Bronsted bases. Thus, in principle, the efficiency of the nucleophilic addition should significantly increase if a carbon-metal bond in organometallic reagents can be activated by Lewis base catalysts and the substrates can be activated by native Lewis acid function of organometallic reagents. We report here that the highly efficient catalytic carbon-carbon bond forming reactions via carbon-metal bond activation in organometallic reagents using simple metal salt catalysts. A variety of acid-base promoting catalytic reactions, such as Grignard reaction, organozinc addition, 1,4-addition of organocopper reagents, trimethylsilylcyanation, and Mukaiyama aldol reaction, were achieved toward the efficient asymmetric catalyses. J. Fluorine Chem. 2008, 129, 994-997. Double asymmetric induction was achieved in the reaction of anhydrous phenylglyoxal with d-(+)-menthol promoted by a (S,S)-t-BuBox・copper(II) hexafluoroantimonate complex. Efficient total syntheses of fluvibactin and vibriobactin have been achieved via molybdenum(VI) oxide-catalyzed dehydrative cyclization, Sb(OEt)3-catalyzed ester-amide transformation, and WSCI and HOAt-promoted dehydrative amide formation. Org. Lett. 2008, 10(13), 2893-2896. Catalytic and highly enantioselective Diels-Alder reaction of cyclic and acyclic dienes with α-phthalimidoacroleins provides cyclic α-quaternary α-amino acid precursors. The conformationally flexible chiral ammonium salt of H-L-Phe-L-Leu-N(CH2CH2)2-reduced triamine with pentafluorobenzensulfonic acid is very effective as an asymmetric catalyst for the Diels-Alder reaction. Org. Lett. 2008, 10, 2569-2572. Neighboring-group participation of an acyl protecting group efficiently promotes the Bronsted acid-catalyzed dehydrative cyclization of 1,3,5-triketones to γ-pyrones, whereas a bulky silyloxy group in the β-position retards the cyclization. This reaction provides an efficient synthetic route for a common intermediate for the synthesis of γ-pyrone-containing bioactive natural products. J. Am. Chem. Soc. 2008, 130(24), 7532-7533. We report here the catalytic and highly enantioselective [2 + 4] and [2 + 2] cycloaddition reactions of electron-rich dienes or silyl enol ethers with electron-deficient propiolamide derivatives induced by copper(II)-3-(2-naphthyl)-L-alanine amide complex. Org. Lett. 2008, 10, 2187-2190. The exothermic reaction of 3,5-bis(trifluoromethyl)phenyl or 4-nitrophenyl isothiocyanate with 4-pyrrolidinopyridine (PPY) gave the corresponding arylaminothiocarbonylpyridinium salts in quantitative yields. These novel zwitterionic salts were effective as organocatalysts for the transesterification reaction of an equimolar mixture of methyl carboxylates and alcohols in hydrocarbons such as heptane and octane under azeotropic reflux conditions with the removal of methanol. In sharp contrast, PPY was inert as a catalyst under the same reaction conditions. Efficient tertiary alcohol synthesis is currently one of the　most rapidly advancing fields in organic chemistry, and recent powerful catalytic methodologies can provide versatile tertiary alcohols, even with enantioselective properties. This review summarizes work on the highly efficient catalytic synthesis of tertiary alcohols from ketones and organometallic reagents. New trends in the catalytic synthesis of tertiary alcohols, including functionalized ones, such as tertiary cyanohydrins and tertiary aldols, are examined from the frontier viewpoints that use typical or transition-metal catalysts, organocatalysts, and metal ate complexes, among others. The selective synthesis of phosphoric acid diesters has been achieved through the direct catalytic dehydrative condensation of phosphoric acid with two equivalents of alcohols. The present method works especially well for the synthesis of cyclic phosphoric acid diesters. The combination of perrhenic acid and N-methylbenzylamine efficiently catalyzes the dehydrative condensation of phosphoric acid with equimolar amounts of diols to give cyclic phosphoric acid diesters in excellent yields. Tetrahedron Lett. 2008, 49, 379-382. The enantioselective alkynylation of aldimines with terminal acetylenes catalyzed by chiral Cu(I) complexes with (R)-2,2’-di(2-aminoaryloxy)-1,1’-binaphthyl ligands (7) was examined. Chiral C2-symmetric N,N-ligands 7, which have primary aniline moieties, were readily prepared from inexpensive (R)-1,1’-binaphthol (BINOL) as a chiral source. In particular, the reaction of N-benzylidenebenzeneamine 1a with phenylacetylene 2a proceeded smoothly in the presence of 5 mol % of (CuOTf)2・C6H5CH3 and 10 mol % of (R)-7d at room temperature for 24 h, and the corresponding propargylamine 3a was obtained with up to 82% ee.